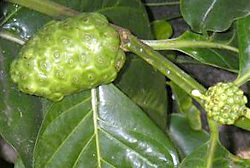 Noni (Morinda citrifolia) is an evergreen tree. The juice of noni fruit has been traditionally consumed and is said to be effective as a health and beauty agent as well as in strengthening the immune system, preventing heart disease and treating diabetes and hypertension. At Bizen we have focused specifically on noni's ability to lower blood pressure. The renin-angiotensin system is a mechanism involved in the onset of hypertension. Angiotensinogen produced in the liver is converted by renin and Angiotensinogen Converting Enzyme (ACE) into Angiotensin II, which causes an increase in blood pressure. Noni juice has been shown to inhibit ACE activity, and in tests using rabbit lungs, the IC50 was 5.1 µL/mL.